Research Note: Co-Isolation of Plant and Pathogen/Parasite DNA and Its Potential Use in Disease Detection and Monitoring. The isolation of DNA from multiple divergent species is important for investigating microcosms, whether it is symbiotic biomes or host/parasite interactions. In the case of the latter, rapid and easy isolation of DNA from the host/pathogen can allow for detection and monitoring of infection. Within the agricultural realm, a simple method for isolating DNA from both the host and pathogen, followed by quantification, can demonstrate the presence of a pathogen and be used to determine the extent of the infection (Gachon and Saindrenan, 2004). For instance, the ability to rapidly assess such host/pathogen levels could be useful in determining the application of pesticides (McCartney et al., 2003). OPS Diagnostics developed the Synergy™ DNA isolation chemistry in order to rapidly isolate plant DNA for standard PCR assays. Synergy™ is a chloroform-free chemistry that relies on bead beating to separate contaminates from the nucleic acids. Its use was rapidly expanded to real-time PCR and applied widely to field work and population studies. Upon request, we modified the process for screening Drosophila, which worked well. Consequently, we developed the concept of using the Synergy™ chemistry for isolating DNA from multiple mixed sources simultaneously. Due to our own interest in plant pathogens (specifically those associated with grapes), we explored the use of Synergy™ 2.0 to isolate DNA from cultured Fusarium, Enterobacter, and Caenorhabditis elegans, as models of fungal, bacterial, and nematode disease causative agents. The latter two organisms were then used to spike either leaf or root tissues from corn (Zea mays) respectively, to emulate plant/pathogen relationships. Isolating DNA using Synergy™ 2.0 and quantifying it using real-time PCR we were able to detect relative levels of DNA for both plant and mock causative agents. The experiments were designed to first test the effectiveness of isolating non-plant DNA with Synergy™ 2.0, which was assessed spectrophotometrically and by using qPCR. The subsequent experiments involved isolating the same non-plant DNA from intact organisms that were spiked onto plant tissues (i.e., corn leaves and roots) in order to simulate disease causative agents in association with their host. Synergy™ 2.0 Plant DNA Extraction Kit and protocol were used for all isolations (see link). The process included disrupting the sample by bead beating, binding impurities to the grinding matrix, which was then pelleted by centrifugation. The DNA, suspended in the supernatant was bound to a spin column, washed, and eluted. The DNA was quantified using a DeNovix spectrophotometer and then amplified via real-time PCR. For real-time PCR, the corn chloroplast rRNA was detected using Taqman with FAM while all other amplifications were measured with SybrGreen. The target gene for C. elegans was crp-1 cDNA, for Enterobacter it was translation factor 2 (infB), and an intergenic region (Accession: KI981473.1) was targeted for Fusarium oxysporum (Table 1). Corn Forward 5'-AGC GAA AGC GAG AGT CTT CAT AG-3' One cycle of 95°C for 3 minutes.40 cycles of 95°C for 10 seconds to denature, 50.7°C for 30 seconds to anneal. DNA was isolated from pure cultures of C. elegans, Enterobacter, and Fusarium oxysporum to demonstrate the effectiveness of Synergy™ isolation chemistry on non-plants. Subsequently, corn leaves were spiked with a set of dilutions (1X, 1/100, and 1/1000) of Enterobacter culture and roots were submerged in a suspension of C. elegans. Both sets of spiked corn tissue were then processed using the Synergy™ 2.0 protocol in order to emulate the isolation of DNA from diseased plants for amplification by PCR. The Synergy™ 2.0 protocol generated good yields of DNA with purity ratios within reason (Table 2). Both the 260/280 and 260/230 were slightly above the ideal 1.8 and 2.0 targets, respectively, which can be due to slight RNA carryover. The determination of DNA concentration, however, in no way indicates that the DNA was isolated from more than one organism in the case of the spiked corn samples. Table 2: Spectrophotometric readings of DNA isolated pure cultures of mock causative agents and from spiked corn. Real-time PCR was performed to 1) ensure that the isolated DNA could be amplified, and 2) differentiate between multiple species and relative levels of target sequence. For the samples containing DNA from a single species, Synergy™ 2.0 was effective for isolating DNA from Zea mays, Fusarium oxysporum, Enterobacter, and C. elegans. 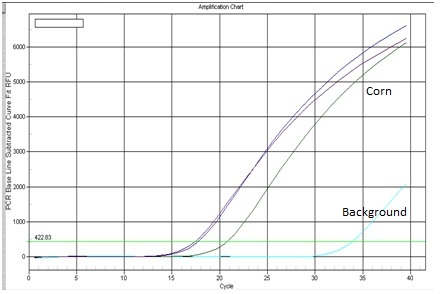 Threshold values for the target genes, in all instances, were more than three cycles (actually between 15-20 cycles) from background, demonstrating high specificity of the PCR (Table 3). Thus, this data showed that Synergy™ 2.0 with chemistry designed for plants is also effective on some non-plant species. The co-isolations of DNA from leaves spiked with different dilutions of Enterobacter and roots spiked with C. elegans were all successfully amplified. In all instances the corn PCR and either C. elegans or Enterobacter PCR were preformed separately as the amplification conditions were not compatible. Similarly, as real-time PCR for C. elegans and Enterobacter relied on SybrGreen for detection, multiplex reactions were not an option. DNA isolated from the corn root spiked with C. elegans showed about equal Threshold cycle (Ct) values, and both were well below background. Consequently, as a model of nematode infection, Synergy™ could detect what might be considered a heavily infested plant. The shortcoming of this analysis is the absence of a true relative ratio of plant DNA to nematode DNA. Future experiments should focus on obtaining a real plant/pathogen system, preferably with samples that could be collected locally in the field. Table 3: Ct values of DNA isolated with Synergy™ 2.0. The amplification of increasing dilutions of Enterobacter is very revealing as to the potential of co-isolating DNA with Synergy™. The Ct values for corn for the three preparations (i.e., 1X, 1:100, 1:1000) were clustered around 18 cycles (Fig. 1). Variability in the DNA harvested from plants is highly dependent upon the sample and its proximity to young tissue. Thus the Ct values of 20.34, 17.29, and 16.96 are not drastically misaligned. More telling were the Ct values for the increasing diluted Enterobacter (Fig. 2). The 1X culture had significantly more copies of Enterobacter than the corn target gene, thus the Ct for 1X Enterobacter is low at 13.95. Indeed only the pure culture of Enterobacter had a lower Ct of 8.54 in these experiments. 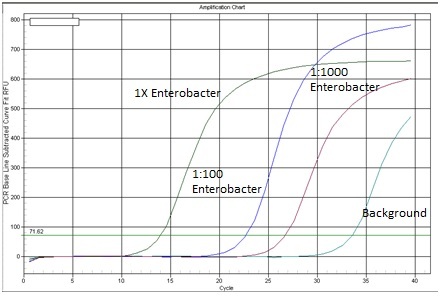 However, as the dilutions of Enterobacter increased, so did the Ct. At 1:100, the bacteria had fewer target sequences than the corn (Ct's of 22.70 vs. 17.29), and at 1:1000, the Ct for Enterobacter increased to 26.70. Though the concentration of bacteria decreased significantly in the spiked samples, the microbes were still easily amplified. This mockup of a plant/pathogen system shows that co-isolation of DNA using Synergy™ chemistry may show promise as a tool for detecting and monitoring diseased plants. To validate this approach, real plant/pathogen systems need to be sampled and tested using the Synergy™ 2.0 protocol. Figure 1: Co-isolation of Corn leaves and Enterobacter using Synergy™ 2.0. QPCR was run using iTaq and corn PCR primers and FAM as a probe. Figure 2: Co-isolation of Corn leaves and Enterobacter using Synergy™ 2.0. QPCR was run using Enterobacter primers and BioRad SybrGreen. This short study concluded that DNA can be effectively isolated and amplified from plants and microscopic life associated with the plants. The Synergy™ 2.0 Plant DNA Extraction Kit, which was originally developed as a rapid tool for harvesting plant DNA, has successfully isolated DNA from bacteria, fungi, and nematodes, in addition to the plant. The use of this system for detecting and quantitating plant pathogens will require additional work that makes use of actual plant/pathogen systems. Gachon, C and Saindrenan, P. 2004. Real-time PCR monitoring of fungal development in Arabidopsis thaliana infected by Alternaria brassicicola and Botrytis cinerea. Plant Physiology and Biochemistry 42: 367-371. McCartney, H., Foster, S. J., Fraaije, B. A, and Ward, E. 2003. Molecular diagnostics for fungal plant pathogens. Pest Management Science 59: 129-142.